I have been trying a lot of Samyang's offerings recently, specifically Sogoki Myun, Sutah Ramen, Kimchi Ramen, and Pojangmacha U-Dong. 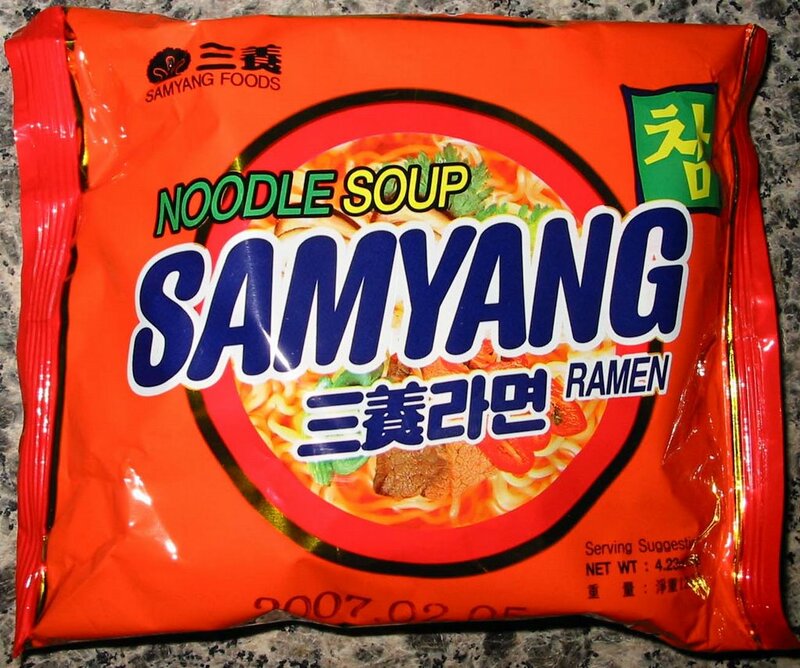 But this one has the special privilege of being named after the company: Samyang Foods. The packaging reminded me of a box of Tide detergent but I didn't let that stop me from trying it. No surprises on the inside...like almost every other Korean ramen in the world, there is a big block of noodles with a spice packet and a dried vegetable packet. The steam from the broth fogged up my camera lens! But let me tell you, this was quite a tasty ramen with plenty of heat yet plenty of flavor as well. I especially liked the shitake mushrooms included in the veggie packet. You don't see that very often for some reason yet they add a lot of potent bursts of flavor to the whole package. This is quite similar to Samyang's Sogoki Myun, Sutah Ramen and Kimchi Ramen but comes together a little bit better. Very satisfying and deserving of the Samyang name! I really like your reviews and have just started doing a video podcast called cookin with nimmo, there is not a link directly to the podcast on the site, something I'm a little disgruntle about, but if you type in nimmo in the podcast directory search field, episode 1 will come up. 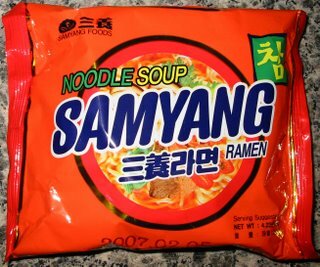 I've enjoyed most samyang products, though I have yet to try this eponymous version. I'll look for it next time I'm at the japanese superstore. Samyang makes a very good cup-style ramen IMO (spicy beef flavor) with actual freeze-dried meat-like bits - you never see that anymore. the superstore sells it for $.89 but I didn't see it last time I was there. samyang ramen company is korean. i dun think u can buy those in japanese markets. I get my Samyang Ramen at Uwajimaya in Beaverton, and at a General Asian store. Bit more expensive than your run of the mill Nissin ramen but sooo much better. And its also no-MSG now. you can find a good selection of korean ramen at ramenklub.com. plus they have ramen videos where people can share. Samyang Ramyun is the the father of all Korean ramyuns. Until twenty to twenty-five years ago, there were no other ramyuns in Korea. 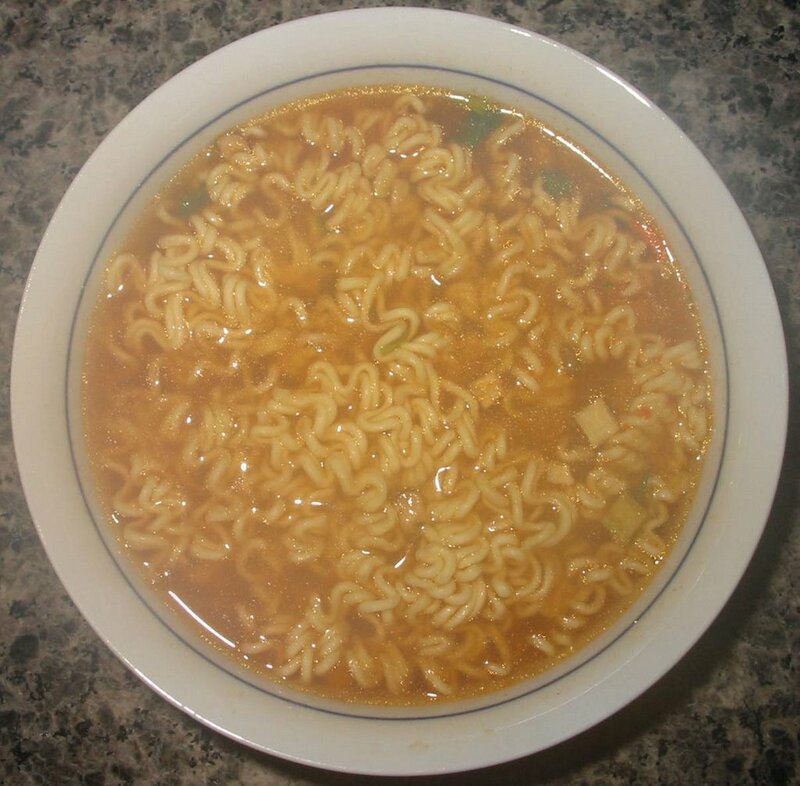 The current standard for Korean ramyun is the Shin Ramyun, but this is still the standard for the older generation. Can't go wrong with samyang ramen! One of my top favorites.